25 additional units (1827-1851) are planned for 2019. Roster last updated on April 12, 2019. 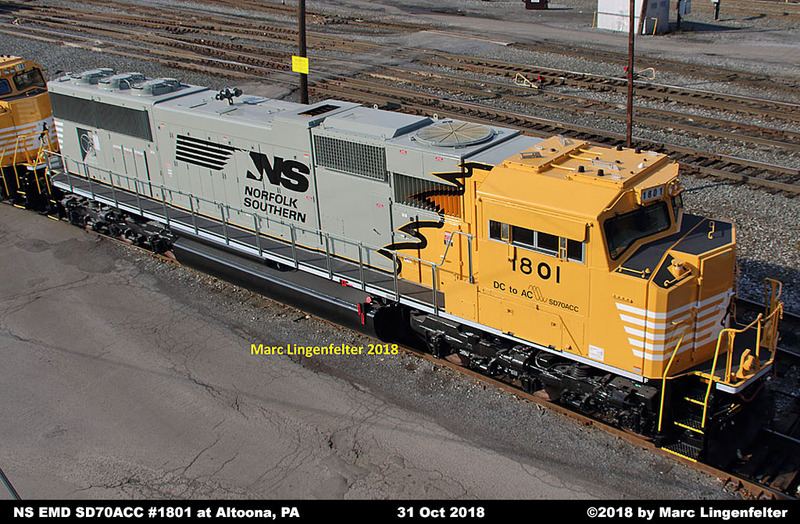 1800 NS EMD SD70 2537 03-2018 Progress Rail - Muncie, IN 09-1994 936433 936433-6 Painted in special yellow, gray, black, and white scheme to highlight the conversion from DC to AC traction. 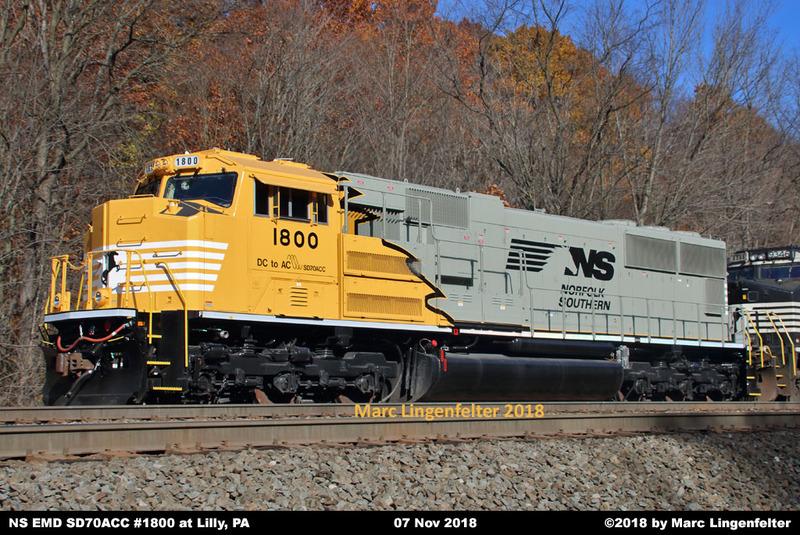 1801 NS EMD SD70 2548 03-2018 Progress Rail - Muncie, IN 09-1994 936433 936433-17 Painted in special yellow, gray, black, and white scheme to highlight the conversion from DC to AC traction. 1802 NS EMD SD70 2505 11-2018 Progress Rail - Muncie, IN 05-1993 916218 916218-5 Unit is painted in standard NS black and white "horsehead" paint. 1803 NS EMD SD70 2503 11-2018 Progress Rail - Muncie, IN 04-1993 916218 916218-3 Unit is painted in standard NS black and white "horsehead" paint. 1804 NS EMD SD70 2532 11-2018 Progress Rail - Muncie, IN 08-1994 936433 936433-1 Unit painted in standard NS black & white "horsehead" scheme with DC to AC lettering and AC waveform under the cab numbers. 1805 NS EMD SD70 2533 11-2018 Progress Rail - Muncie, IN 08-1994 936433 936433-2 Unit painted in standard NS black & white "horsehead" scheme with DC to AC lettering and AC waveform under the cab numbers. 1806 NS EMD SD70 2521 11-2018 Progress Rail - Muncie, IN 11-1993 936432 936432-15 Unit painted in standard NS black & white "horsehead" scheme with DC to AC lettering and AC waveform under the cab numbers. 1807 NS EMD SD70 2528 11-2018 Progress Rail - Muncie, IN 12-1993 936432 936432-22 Unit is painted in standard NS black and white "horsehead" paint. 1808 NS EMD SD70 2510 01-2019 Progress Rail - Muncie, IN 11-1993 936432 936432-4 Unit painted in standard NS black & white "horsehead" scheme with DC to AC lettering and AC waveform under the cab numbers. 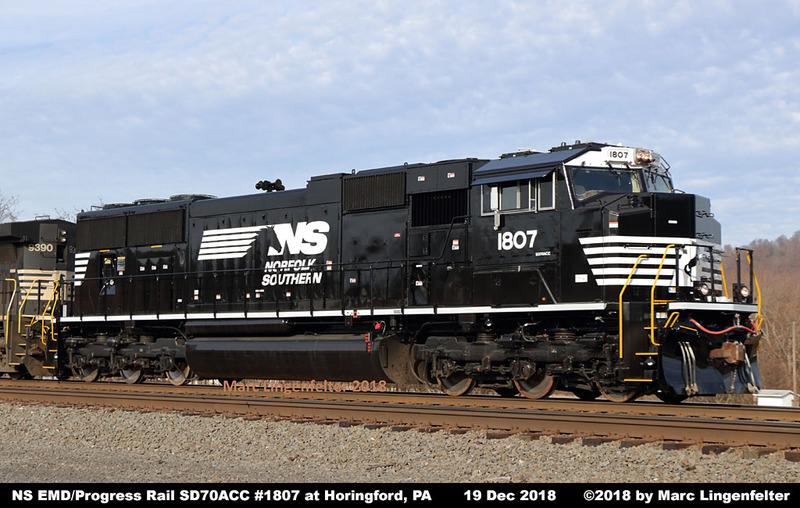 1809 NS EMD SD70 2509 02-2019 Progress Rail - Muncie, IN 11-1993 936432 936432-3 Unit is painted in standard NS black and white "horsehead" paint. 1810 NS EMD SD70 2515 02-2019 Progress Rail - Muncie, IN 11-1993 936432 936432-9 Unit is painted in standard NS black and white "horsehead" paint. 1811 NS EMD SD70 2504 02-2019 Progress Rail - Muncie, IN 05-1993 916218 916218-4 Unit painted in standard NS black & white "horsehead" scheme with DC to AC lettering and AC waveform under the cab numbers. 1814 NS EMD SD70 2517 02-2019 Progress Rail - Muncie, IN 11-1993 936432 936432-11 Unit is painted in standard NS black and white "horsehead" paint. 1815 NS EMD SD70 2541 03-2019 Progress Rail - Muncie, IN 09-1994 936433 936433-10 Unit painted in standard NS black & white "horsehead" scheme with DC to AC lettering and AC waveform under the cab numbers. 1816 NS EMD SD70 2524 01-2019 Progress Rail - Muncie, IN 11-1993 936432 936432-18 Unit painted in standard NS black & white "horsehead" scheme with DC to AC lettering and AC waveform under the cab numbers. 1818 NS EMD SD70 2522 02-2019 Progress Rail - Muncie, IN 11-1993 936432 936432-16 Unit is painted in standard NS black and white "horsehead" paint. 1819 NS EMD SD70 2546 01-2019 Progress Rail - Muncie, IN 09-1994 936433 936433-15 Unit painted in standard NS black & white "horsehead" scheme with DC to AC lettering and AC waveform under the cab numbers. 1820 NS EMD SD70 2514 01-2019 Progress Rail - Muncie, IN 11-1993 936432 936432-8 Unit painted in standard NS black & white "horsehead" scheme with DC to AC lettering and AC waveform under the cab numbers. 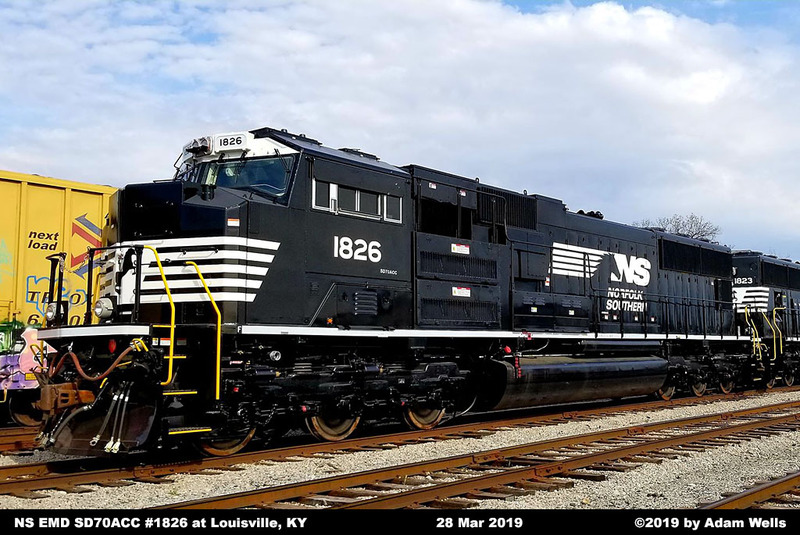 1823 NS EMD SD70 2542 03-2019 Progress Rail - Mayfield, KY 09-1994 936433 936433-11 Unit is painted in standard NS black and white "horsehead" paint. Unit stored at Progress Rail - Muncie, IN for testing. 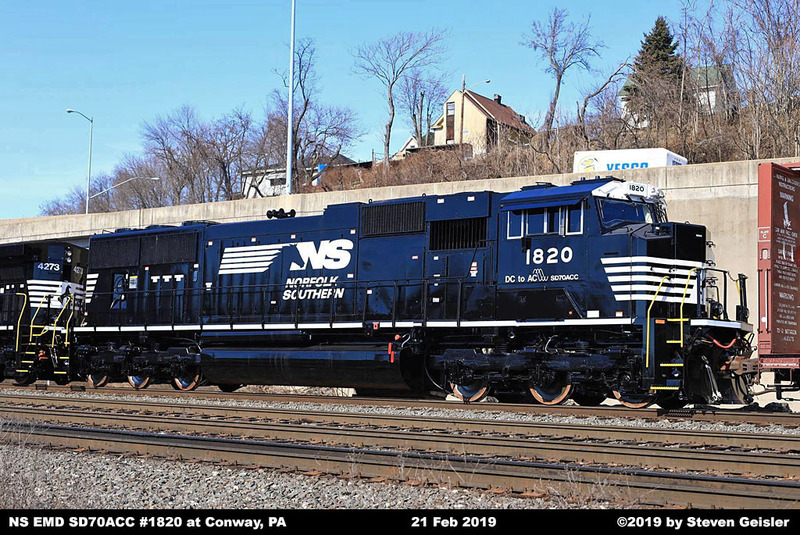 1824 NS EMD SD70 2534 01-2019 Progress Rail - Mayfield, KY 08-1994 936433 936433-3 Unit is painted in standard NS black and white "horsehead" paint. 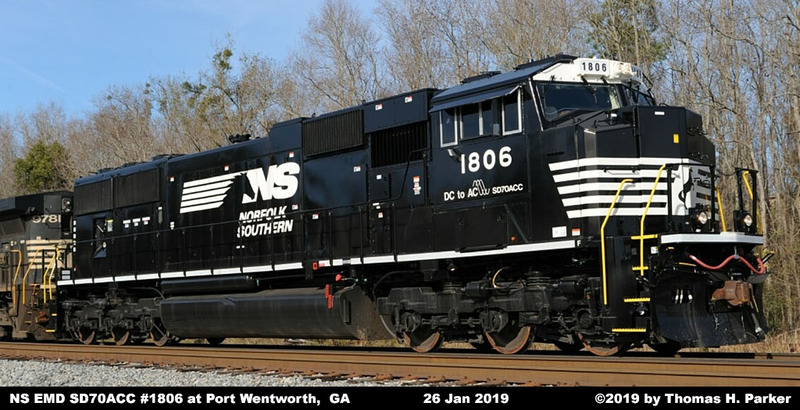 1826 NS EMD SD70 2538 03-2019 Progress Rail - Mayfield, KY 09-1994 936433 936433-7 Unit is painted in standard NS black and white "horsehead" paint. (1812) NS EMD SD70 2530 -- Progress Rail - Muncie, IN 12-1993 936432 936432-24 Unit at the NS Juniata Shops for completion, paint, and final testing. (1813) NS EMD SD70 2531 -- Progress Rail - Muncie, IN 12-1993 936432 936432-25 Unit at Progress Rail - Muncie, IN undergoing rebuilding. (1817) NS EMD SD70 2544 -- Progress Rail - Muncie, IN 09-1994 936433 936433-13 Unit at Progress Rail - Muncie, IN undergoing rebuilding. (1821) NS EMD SD70 2525 -- Progress Rail - Muncie, IN 11-1993 936432 936432-19 Unit at Progress Rail - Muncie, IN undergoing rebuilding. (1822) NS EMD SD70 2501 -- Progress Rail - Muncie, IN 04-1993 916218 916218-1 Unit at Progress Rail - Muncie, IN undergoing rebuilding. (1825) NS EMD SD70 2507 -- Progress Rail - Muncie, IN 11-1993 936432 936432-1 Unit at Progress Rail - Muncie, IN undergoing rebuilding. weight was added to increase the maximum weight to 432,000 pounds when fully loaded with supplies. Existing trucks were rebuilt and new AC traction motors installed. Equipped CCB II computer controlled braking system. All units are equipped with PTC (Positive Train Control) system. Equipped for use in DPU (Distributed Power Unit) operation. Equipped with Automatic Engine Stop/Start.